One of the stories my parents like to tell about me is the one where they took me as a baby to a showing of THE TEN COMMANDMENTS. They say that there were a number of other babies who had to be taken out of the theater because of their crying but according to them, I uttered not so much as a burp throughout the entire three hours and thirty-nine minutes. In fact, my mother claims I simply and quietly stared at the screen with wide open eyes as if hypnotized. Maybe I was. Now, I dunno if this explains my lifelong movie addiction but I do know that if you ask me what my favorite movie is, my answer is THE TEN COMMANDMENTS. I grew up watching THE TEN COMMANDMENTS on ABC here in New York as they would faithfully air the movie each and every Easter. They used to show it in two parts (On Sunday and Monday) and then switched to a single night showing (with commercials it ran from 7PM to 11:30PM) and for some inexplicable reason in recent years ABC has been airing it on the Saturday night before Easter. But it doesn’t matter to me. The first movie I bought on Blu-Ray was THE TEN COMMANDMENTS and I still watch it every Easter, starting it at 7PM on the dot. Moses is raised as a prince of Egypt and is looked upon as a son by the old Pharaoh. This earns Moses the jealousy of Prince Rameses II (Yul Brynner) who already sees himself as the next Pharaoh. It also doesn’t help that they both are in love with Nefretiri (Anne Baxter) the throne princess who must by law marry the man who will be Pharaoh. Eventually, Moses learns of his true heritage and the secret is also discovered by Rameses who has Moses banished. The life Moses once knew as a prince is over but he has a new destiny before him, one that is imparted to him by God Himself in the form of a burning bush. Moses is to return to Egypt and liberate the Hebrew people from their slavery. That’s the barest outline of the story but it doesn’t begin to explore the complexities of the relationships between the characters and how their lives play out in such an epic, impressive movie. And make no mistake about it…THE TEN COMMANDMENTS is BIG. And that brings me to my second reason why I love the movie so much. They just simply just don’t make movies like this anymore. Everything from the costuming to the sets is larger than life. If Cecil B. DeMille needed a city in his movie then by God he went out and built a city. If he needed a crowd scene with hundreds of thousands of people he went out and hired and costumed hundreds of thousands of people and put them on the screen. In this day and age where all the special effects are done by CGI and filmed on virtual sets it gives a movie like this weight and life when you look at it and realize that these are actual people and actual sets. This is a movie that truly deserves to be called spectacular just on a technically physical level. The acting has been criticized as being “over the top” and “melodramatic” and my response is that of course it is. When you have a story and setting this enormous you’ve got to have actors and acting to match. If Charlton Heston had never made another movie after this his place in movie history would still be assured. Moses was the role he was born to play, plain and simple. He starred in another Biblical epic three years later “Ben-Hur” but this is the movie that everybody thinks of first when Charlton Heston’s movie career is talked about. Anne Baxter gleefully chews every piece of scenery in sight and has more fun with her dialog than anybody else in the cast. Her scenes with Sir Cedric Hardwicke have real humor and affection while her scenes with Yul Brynner are nothing less than white hot. In fact, I believe I enjoy her scenes with him more than her scenes with Charlton Heston, to be honest. Yul Brynner comes close to stealing the movie more than a few times. One of the excellent aspects of the screenplay is that it takes time to examine and explore everybody’s point of view and motivations and the motivations of Rameses are clear and understandable, if misguided. 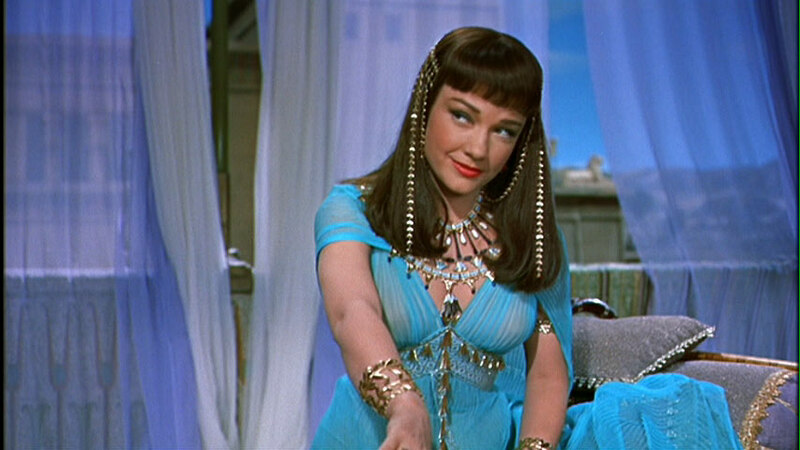 Blu-Ray has spoiled me watching THE TEN COMMANDMENTS as the detail, color and audio is absolutely extraordinary. There’s simply no other way to watch it as far as I’m concerned. The only problem is with some of the blue screen special effects not looking so special in such rich detail but if you love the movie as much as I do, no doubt you’ll overlook that. The sheer emotional power of such scenes as the parting of The Red Sea and the fiery finger of God writing The Ten Commandments overcome that for me. So should you see THE TEN COMMANDMENTS? No doubt you already have but just in case you haven’t, then by all means you should. If you’ve watched and enjoyed movies such as “Titanic” “Avatar” “Lord of The Rings” and “Star Wars” then this is their grandfather. It’s sheer visual grandeur that still has the power to blow audiences away. It’s the best example of captivating, enthralling movie making that succeeds in transporting us to another time and place. It’s a story of faith and destiny with romance, action, adventure, drama, humor and spectacle. You ask me what I think is the greatest motion picture ever made and I’ll say THE TEN COMMANDMENTS every time. 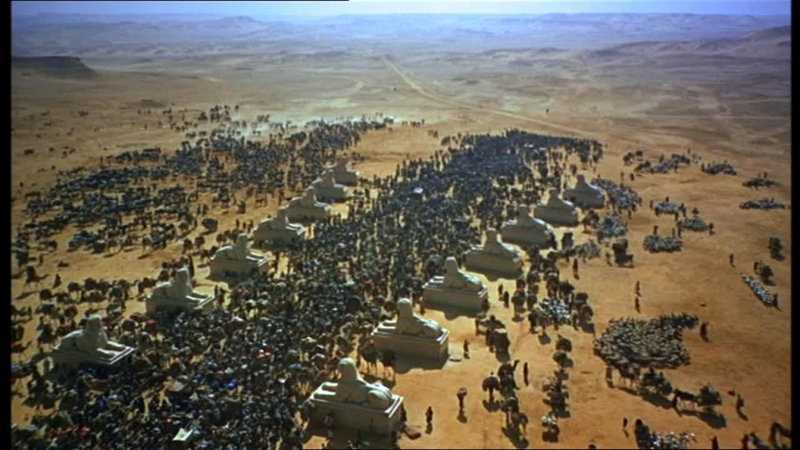 THE best moment in the film, to me, and it is hard to pick, is when they raise the obelisk on the old Pharoah’s jubilee. The sequence only lasts for about 20 seconds, but I invariably get gooseflesh. It is, though, a magnificent piece of Hollywood Biblicality. Thanks for the great review! The only thing that puzzled me about ABC’s advertising this as an Easter special presentation is that its basis is the Old not the New Testament.